What a woman eats while she is pregnant is one of the first ways she can support her child’s long-term health. While an improper diet can contribute to risk factors such as premature birth, delayed development, and low body-mass index, choosing the right foods can supply an unborn baby with adequate nutrition and determine the baby’s quality of life as it grows. Oily fish is one food that offers massive benefits to mother and child, but it is subject to much debate about how much of it can be consumed safely. Research clearly shows that fish oil supplements taken in the second trimester will help babies be strong. Increased bone density in the first six years of life is one tremendous benefit as it means fewer injuries and broken bones for a rambunctious young child. The development of healthy fat cells, called adipogenesis, is another effect of the consumption of oily fish during pregnancy that can increase the health of the fetus’s brain, organs, and ligaments. The debate about how much oily fish is safe stems from the levels of mercury currently found in our fish supply and disagreement about how much of it is considered safe for an unborn child. There are studies that show high levels of mercury can increase the risk of behavioral disorders such as ADHD. Thankfully, there are some fish that are known to contain low levels of mercury and can be safe to eat regularly, such as salmon, flounder, and haddock. The fish that should be avoided are shark, fresh tuna, mackerel, and swordfish. Oily fish contains long-chain polyunsaturated fatty acids, which are essential for development. Not only are fish oils good for your hair and skin but also your baby’s eyes, immune system, and brain. Babies whose mothers regularly take fish oil from the second trimester are consistently found to have a higher body mass index with no increased risk of obesity. Although there are claims that even small levels of mercury found in virtually all of our fish supply can produce neurotoxic results, omega-3 deficiency is related to 93,000 premature infant deaths every year. A child’s immune system may struggle or fail to fully develop, and it can lead to life-long emotional and learning disorders. After giving birth, if a woman is deficient in omega-3, her breast milk may lack this healthy fat that her child needs for continued development. Unfortunately, deficiency in omega-3 is a prevalent problem for many women today. However, it is easily supplemented either by consuming safe, low-mercury fish or taking a high-quality fish oil supplement. Some researchers even believe deficiencies in omega-3 and docosahexaenoic acid (DHA) can result in preeclampsia and postpartum depression. These are two frightening possibilities which may be prevented by preparing the body nutritionally and thus preventing any possible deficiencies. Along with preparing for a more natural labor, the benefits of omega-3 can help reduce complications for a newborn. Optimizing omega-3 levels can drastically increase the likelihood of carrying a baby full term, which reduces the likelihood of respiratory difficulties, gastrointestinal problems, and vision or hearing impairment for a newborn. Signs of omega-3 deficiency include lethargy, fatigue, aching muscles, dry skin, extreme thirst, and mood swings. Although these symptoms are easily confused with typical pregnancy symptoms, it can be beneficial to think back to before pregnancy to determine if you showed some signs of being omega-3 deficient. 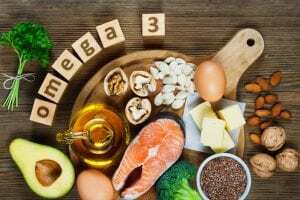 Although low-level exposure to mercury-contaminated fish has been found to increase the risk of behavioral disorders, there is also a considerable risk in not getting enough healthy omega-3 fatty acids. Oily fish is a great source of these essential nutrients, and by carefully limiting your consumption to fish considered safe and eating only two servings per week, you dramatically reduce the risks related to consuming mercury-contaminated fish and can reap the benefits of meeting your nutritional needs for omega-3. It can be a tough call for some, knowing the risks and benefits, but as long as you follow the guidelines for consuming fish during pregnancy, it is safe and beneficial to do so and can help your baby thrive.